Salads refer to a cold mixture of various raw vegetables +/- fruits, served with a cream or oil dressing and only recently have I personally experienced/realised why these colourful plants should be a constant in the diet of every individual. Like many ignorant people out there, I used to think salads actually only referred to coleslaw-( popularly known as vegetable salad ) or a mix of chopped up fruits (popularly known as fruit salad) and were only necessary for adding flavour to rice meals or dessert, with regards to the fruits 😄. 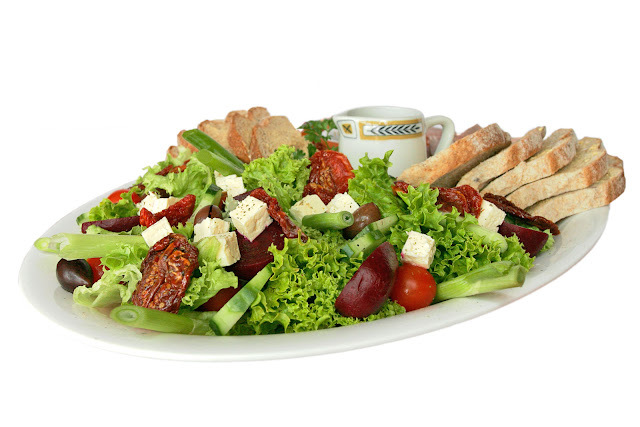 Not until I started working in British Hospitals,did I realise that salads, were mostly a mixture of nutritious raw vegetables and fruits that could make all the difference between a healthy and unhealthy diet. Admire the lovely salad on flick this Saturday Evening and find out below why you must make such a constitution part of your regular diet. Experts have identified salads as one of the best sources of nutritional fiber - portions of plant derived food that cannot be completely broken down by digestive chemicals. This fiber or roughages as sometimes called, pass down from the small intestine to the large intestine to help the forming stool develop better bulk that can be easily passed out. The suggested cause of bowel cancer in many cases, has been linked to the longterm absence of dietary fiber in the diets of many victims. How this exactly can happen is long medical grammar for another day; if you don't mind. The simplest realtime explanation of this benefit is appreciated when you wake up for 3 consecutive days feeling constipated, until you grab a salad or any other source of dietary fiber like cornflakes/cereals or even oranges and eventually experience the greatest intestinal relief of your life in.....you know where. Vegetables and fruits, the major components of salads, are confirmed excellent sources of vitamins and vital mineral salts in the body that play very important roles in a multitude of stabilising chemical activities that must occur for everyone of us to feel well overall. Ranging from: skin and bone maintenance to body electrical impulse transfer (nerve conduction) to overall brain function or even general organ function-sexual organs not excluded, a proper balance of vitamins and mineral salts in addition to other factors, will give you the right fix and put your body in a position to function optimally. There is no better way to explain it. Only a trial can convince you. Are you one of those battling with weight loss or struggling to maintain a healthy diet to normalise your Cholesterol levels for better blood pressure or blood sugar controls? Have you ever been in a situation where, you really wished you could keep your eating as healthy as possible but circumstances just wouldn't permit? The Doctor has asked you to reduce or cut out starchy carbohydrates for dinner which must not be eaten later than 7pm/19:00 but you wake up really early to go to work and remain so busy all day that, the only opportunity to eat anything major is late night after you close and you feel starchy carbohydrates are the only filling option right? This is exactly the concern I have gotten from a lot of patients in the past but say no more; a colourful portion of salad served with your favourite barbecue fish or grilled chicken or turkey...etc.... will do the magic. In conclusion, all of the above grammar can be summarised in the fact that, with salads you can't go wrong diet wise. There are different types and when eaten alongside your favourite fish or meat or whatever, you will certainly get as full as you want, yet remain as healthy as possible.